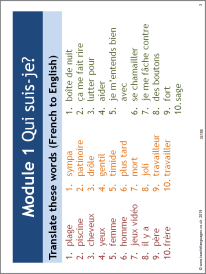 This PowerPoint is a great way to support differentiation vocab revision for GCSE French – with no photocopying! Designed to cover key vocabulary from the eight modules of the Studio AQA GCSE French textbook, it could be used with any class for topic revision. Try covering one topic per lesson, either French to English or English to French – or both!. Revisit the vocab the following lesson to see some progress. Instructions are on slides 1-2. Fantastic, thank you! This would be great to have in German (based on Stimmt) as well.